Autumn Splendor! Just For Fun Color Challenge #24! Need I say anything more . . . Jersey Boys was totally awesome! I loved every minute of it and sang along with the girls sitting next to me. Did I know them? NOPE but had an absolute fabulous time! Would I go back? YOU BET! I told you yesterday that I would have a tutorial on Splitcoaststampers today. Well it’s up and it’s all about Alcohol Inks and Faux Bleach/Batik. You can find the written tutorial here. Remember life is short . . . . make each day count! Oh…my…gosh! I just LOVE those cards!!! Now, I’m going to watch the video!! I had a boy in jr high sing this song to me under my bedroom window. What a memory. Cards are sweet! I had already checked out Splitcoast. I saw JB three times when it was in Indy! I’d go every night if I could afford it. I love your videos and your great sense of humor! When you refer to “glossy” cardstock, is there a particular brand that you use? I’m not really sure what to get that qualifies for this technique. oohhh love those cards. Gonna watch the video tonight…hoping I have some time to play :-). Wow Sherry, that looks cool!! I think I am going to try this technique I actually have all I need except a craft iron. But I have an old iron I think I will use it. Thank you so much 🙂 I love learning new things!! You’ve gone and done it now, starting me singing again. lol. 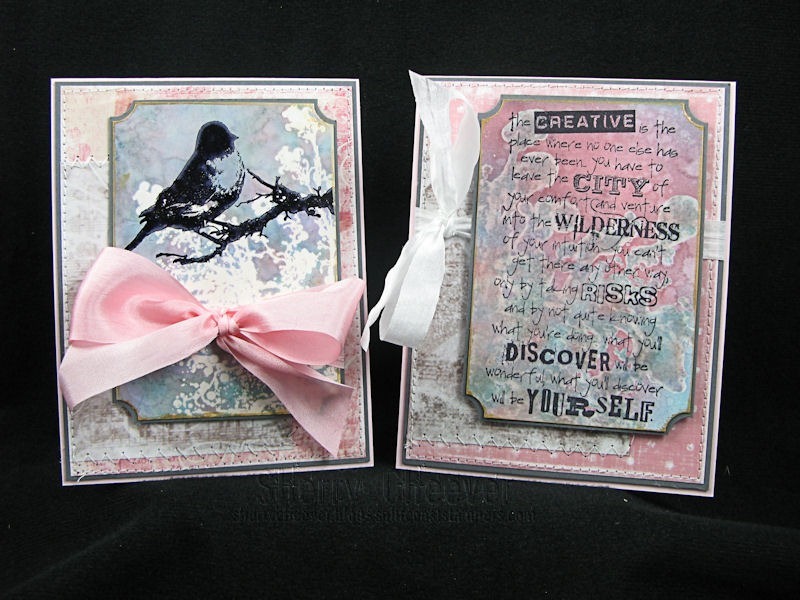 Sherry I love this tutorial, 2 beautiful cards from 1, now that’s value. I don’t have a craft iron yet but do have an old iron I could use, I kept this old one for emergencies when I treated myself to a steam generator iron last year, to help cut the chores time down a bit. 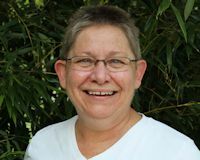 Your laid back way of teaching is so fun-and REAL. We all really like your earthiness. Great tutorial! I’m so jealous! I’d love to see Jersey Boys. Bet I could sing along with every song. That’s definitely my era. Thanks for sharing the tutorial. Love the tutorial & the cards are an absolutely WOW. And the Jersey Boys, OMG, they were the best. Saw the production in Raleigh, NC & the cast was staying at our hotel. Yummy! I too, would & could see the play again, over & over. You sing your heart out Sherry baby!!! 😀 Glad to hear you had an awesome time! Saw your video this morning on SCS’s and loved it! Great job and glad you had a good time at the show last night. TFS! These cards are great and I love getting two for the work of one (technique). I will definitely schedule this technique for one of my classes. Thanks. Now, the shame… who are the Jersey Boys? Am I too old? DH and I lived in Mexico for 11 years and I missed a lot of the headliners at the time (90’s through 2003), but the words to that song seem to sound familiar. Oh well… guess I’m about to google them and take a look. Glad you had fun. OK, now I feel a bit silly. I was thinking that Jersey Boys was the name of an actual group. Of course, after watching the videos (yes, all of them) on the website, I would love to see this. Hey, The Jersey Boys was the BOMB, I saw it in Charlotte earlier this year. The BESTEST show ever!!!! Right up there with wicked my other fav. Love your cards and this is a great technique. The video was a very good teaching video — loved it. So much fun! Great video, thank you. Wow, you are quick! I just got my first alcohol inks and applicator, but I got bright colours, an they come out wayyy too dark, so I am thinking I am doing something not quite right lol. Great cards. Oh wow! these are absolutely stunning, the colours are just gorgeous and they are just gorgeous! Adore these cards, especially the bird outline ~ beautiful. Loved those Jersey Boys also! Thank you so much for the video tutorial. I learn so much from them. Wow Sherry…these are awesome! TFS!! The cards are beautiful! Saw Jersey Boys in NYC; one of my all time favorite musicals there, along with Momma Mia. The video tutorial is a good one; answered some questions regarding the use of cut and dry sponges and getting two images from one stamped image. Thanks, Sherry! LoVe LOVE lOvE your video :0) You always make me smile with your comments and then it makes me Wish, big time, that you live or visited Toronto, Canada. WAAAAAAAAAAAAA! And of course, you always make it look sooo easy. How neat that you can get two cards out of this technique, it sure is nice to watch how you do it, Beautiful cards, tfs! I used it to make the background and love how it turned out. Will definitely be using it again. I was happy to discover this technique and video. So glad I found your blog, it is a real source of informations and tips.